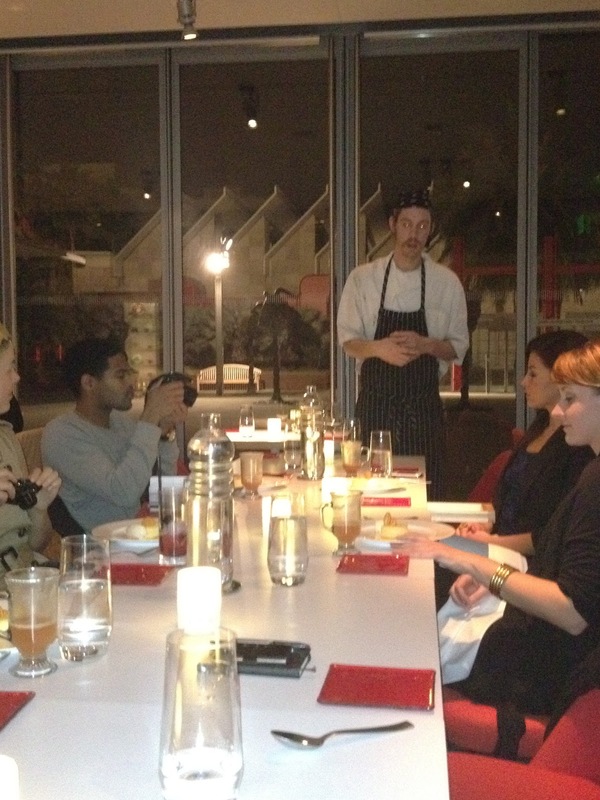 The thing with the Patina Group's Ray's & Stark Bar is it didn't have to be good. It's set amidst LACMA after all. Due to the iconic setting, Los Angelenos would probably dine at the restaurant and enjoy drinks at the bar no matter what they were serving. So color me thrilled when I first tried the spot late last year and quickly realized the food, the drinks and the desserts were top notch. That experience behind me, I oft dreamt of a return visit. Thus imagine my pleasure when I was recently invited to sample some of celebrated pastry chef Josh Graves' newest desserts. Four sweet dishes in all -- three recent additions to the menu and a new Graves' concoction to be featured on the Ray's & Stark Valentine's Day menu. Bobbin For Bourbon - apple infused bourbon, raspberry rooibos tea, freshly squeezed lemon juice. 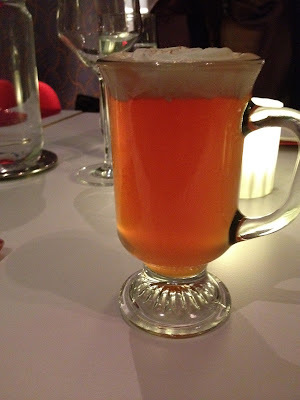 I wanted to get a cocktail to wash down all the desserts, so I ordered this seasonal hot apple bourbon drink that was very smooth and perfectly tart. 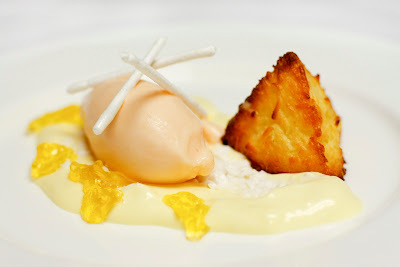 Coconut - coconut pudding, coconut macaroon, coconut granita, guava frozen yogurt, calamansi gelee, meringue stick. I'm not the biggest coconut dessert fan (sorry George Bailey), but I still loved this dessert. Especially the pudding and guava ice cream (made with guava from the manager's backyard - HOW LOCAL IS THAT!?!). 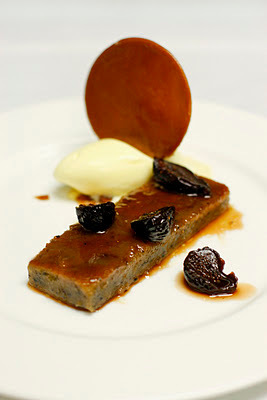 Sticky Toffee Pudding - Date cake, redwine figs, Drake Family Farms goat cheese ice cream, toffee. A great rendition of a classic dessert with the added bonus of fresh goat cheese ice cream. Score. 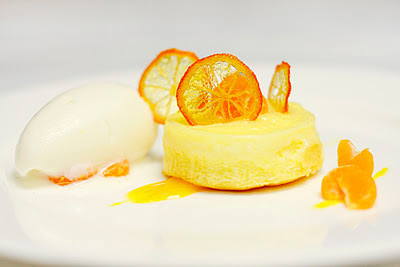 Citrus - lemon budino, tangerine confit, bergamot yogurt, mandarinquat chip. 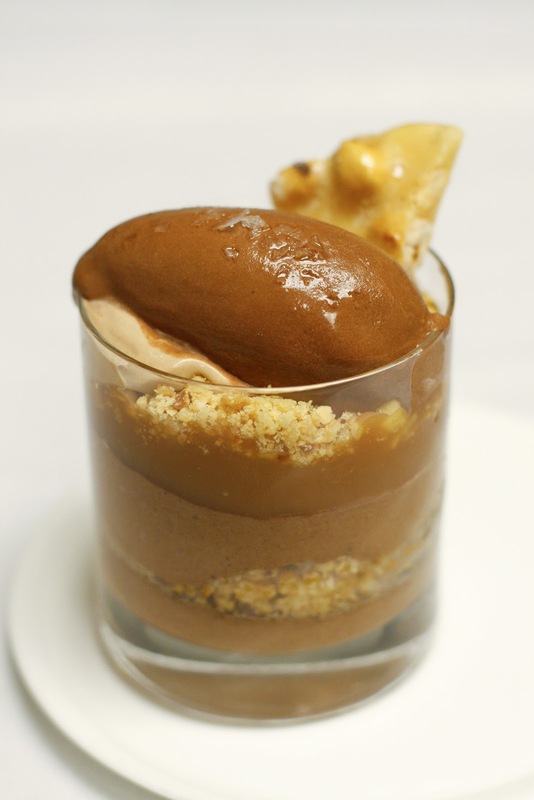 Chocolate - dark chocolate mousse, caramel sauce, milk chocolate whipped cream, praline, chocolate sorbet, hazelnut brittle, Maldon sea salt. This chocolate wonderland in a cup was definitely the unanimous star of the night. So much chocolate and so much subsequent happiness. BTOs (Better Than Oreos) - The chef also sent out a few of the restaurant's signature cookie, the delectable BTOs which are, in fact, much better than Oreos. Housemade Bread - As if the chef hadn't filled our bellies with enough carbohydrates, he sent us all home with a housemade loaf of his bread. Thanks, Chef Josh. Four amazing desserts. Can't wait to go back. Those desserts are so yummy, I want to taste at least one of them! I will visit this place someday for sure.